For the Public Works industry May is an exciting and important time. The third week in May is set aside as Public Works Week nationally. It was John F. Kennedy who issued the first Presidential Proclamation in 1962. Instituted as a public education campaign by the American Public Works Association (APWA), National Public Works Week calls attention to the importance of public works in community life. The Week seeks to enhance the prestige of the often-unsung heroes of our society-the professionals who serve the public good every day with quiet dedication. APWA encourages public works agencies and professionals to take the opportunity to make their stories known in their communities. Over the years the observances have taken many forms, including parades, displays of public works equipment, high school essay contests, open houses, programs for civic organizations and media events. The occasion is marked each year with scores of resolutions and proclamations from mayors and governors, as well. Arizona Governor Doug Ducey has issued a Proclamation for Arizona and will be publicized in this month’s newsletter and on our website. Cities are encouraged to obtain recognition from their officials. The National Public Works Week How-To Guide is one of several resources the Association makes available to agencies to assist them in the development and implementation of their own individual celebrations. With this tool, an agency will learn how to create proclamations and solicit endorsements from government officials, develop media and press releases, write editorials and articles, and generate material for speeches. There are also several suggestions for celebratory activities to be implemented at the local level. The 2016 National Public Works Week Poster focuses on the pervasiveness of public works. The community depends on the men and women of public works and their professions who are always there and always ready. This idea is reflected in the theme “Public Works Always There.” You can purchase a copy on APWA Public Works Week website. ****** The Statewide Conference and Hotel Registration is open now! National Public Works Week was the brainchild of Rear Admiral Cushing Phillips, the president of the Los Angeles Board of Public Works. Established in 1960, NPWW is a way to honor public works staff who keep our communities going. Celebrations have grown over the last half-century, from simple proclamations to multiple events communities carry out throughout the week. This year, NPWW will take place May 17 – 21. The theme is “Public Works Always There.” Here are some of the ways to celebrate NPWW, along with resources to get you started. And don’t forget to tip off the media so your public works staff get some well-deserved recognition! Ask your mayor to issue a proclamation! Visit APWA to find samples from other communities and a free template. Use the great free artwork created by APWA to post signs, create event flyers, and post web content. Ramp up your social media presence by posting your events on APWA’s Twitter feed. Use #NPWW to have your post included. Help students learn about public works through contests, presentations at schools, and field trips. Offer educational programs on topics like water conservation, work zone safety, and recycling. Or show off your muscle with a heavy equipment demonstration. Set up educational displays and exhibits at municipal buildings, schools, and local shopping malls. Open your doors to the public with a public works open house or tour. Hold a fair like this one in Pittsburg, California featuring equipment exhibitions, information booths with models, demonstrations, work zone safety displays, children’s activities, and raffles. Include appearances by APWA mascot PW Paws or departmental mascots, or use these free character stand-ups of PW Paws and Chipper to attract attention. Consider piggybacking on other local events that will attract your community’s residents. Hold an equipment “rodeo” and invite residents to join in the fun. Hold a contest like the City of Glendale’s student “Design-A-Sign” contest to create the best poster on recycling. Post the winning artwork on recycling trucks, online, and at recycling facilities. Hold a community photo contest like the City of Irvine, California and post the best images online, at local libraries, and in public buildings. Rally your residents with a volunteer activity, such as trash pickup or even organized water sampling, like the City of Davenport, Iowa. Hold a softball tournament with other cities, counties, or agencies. Or hold a community sporting event like a race or golf tournament. Hold your own Employee Olympics featuring a construction cone relay race or trash bag toss like the City of Indianapolis. Designate one day during the week as an employee appreciation day. Provide congratulatory certificates and offer free snacks, distribute gifts like t-shirts or hats, or hold a pancake breakfast or barbecue. Designate a “bring your family to work” day at public works facilities like Tompkins County, New York did. Still looking for ideas? Scroll to the bottom of this page to check out what other communities have done. They’ll inspire you! Finally, in addition to the great resources provided, APWA offers excellent guidance for setting goals for NPWW-related activities and events and establishing workable schedules. After your event, don’t forget to get some great exposure for your community by letting APWA know what you’ve done[TB1] . Send a summary of events, photos, links to videos, and electronic copies of proclamations to Jared Shilanek at jaredshilhanek@apwa.org. They’ll post the information you provide on the APWA national NPWW website—giving you and your community the attention you deserve! Achen-Gardner Construction (Achen-Gardner) recently completed two federally funded roadway construction projects; Broadway Road Improvements for the City of Tempe and Valencia Road Improvements for the Pima County Department of Transportation. Both of these roadway enhancement projects have unique features and challenges. The project teams’ collaborative environments provided the foundation that allowed the projects to be completed on time and on budget while also ensuring quality, value, and safety. 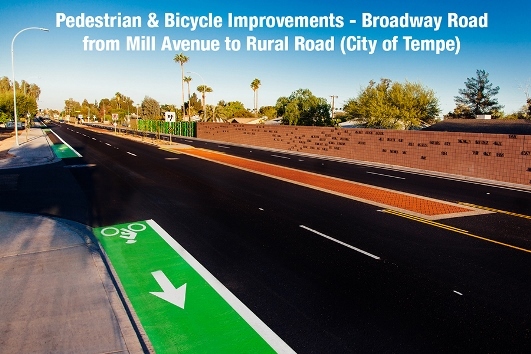 Project Background:The Pedestrian and Bicycle Improvements - Broadway Road from Mill Avenue to Rural Road project’s main challenge was to provide an enhanced experience for pedestrians and bicyclists traveling through one of the busiest vehicular traffic roadways in Tempe. This one-mile corridor is exceptionally congested due to its close proximity to multiple educational facilities, dozens of businesses, and hundreds of residences. In February of 2015, Achen-Gardner was selected using the Design-Bid-Build delivery method to assist in removing one of three eastbound lanes of vehicular travel and adding both an eastbound and westbound bicycle lane in conjunction with wider sidewalks along the entire length of the road. Project Scope: This project included the demolition and removal of 9,100 square yards (SY) of asphalt concrete pavement, 13,936 linear feet (LF) of curb and gutter, 51,412 square feet (SF) of concrete sidewalks and driveways, 18 concrete catch basins along with interconnecting pipe, and the relocation and/or removal of hundreds of native trees. Teamwork, Stakeholder Access, and Project Phasing: With a large amount of complex work to complete in a relatively short period of time, Achen-Gardner (General Contractor) coordinated with the City of Tempe (Owner), Parson Brinckerhoff (Design Engineer), and all project stakeholders in planning the work to ensure the construction activity had minimal impact on area residents, businesses, and the travelling public. Every business entrance and residential driveway was constructed in halves or thirds to maintain access, and all of the businesses had one entrance and one exit throughout the duration of the project. Also, project phasing and a detailed traffic control plan provided room for pedestrians and bicyclists to move through the corridor. In conjunction with this detailed phasing plan the Achen-Gardner team spent more than 650 man-hours completing daily lane closure adjustments prior to commencement of the morning and afternoon commutes in an effort to maintain two lanes of travel in the direction of the peak flows. Streetscape Features and Project Success: In addition to new sidewalks, bike lanes, and landscaped medians, this project has many notable features including more than 20,000 SF of artistic screen walls. The walls (8-10 feet tall) were constructed along the north side of Broadway Road and replaced the sour orange trees that once lined the roadway. The walls not only separate the adjacent Broadway Lane frontage road and neighborhoods, but also feature public art titled "Hedgerow", designed and installed by local artists Laurie Lundquist and Rebecca Ross. The privacy walls were cleverly enhanced with 123 steel "tree profiles" and 1,250 square "pixels" in various hues of green and orange to create the sense of a hedge of orange trees and pay homage to the trees that are now gone. Shadow effects are created by the sun during the day and streetlights at night, creating continually evolving visual interest. The artists were also able to enhance the aesthetic experience of the adjacent block walls by incorporating specific block patterns in its design. Continuing the orange tree motif, Morse code patterns spell out "orange trees" and "blossoms" in repeated sections. Other notable aesthetic improvements include the decorative stamping of crosswalks at the intersections of Mill Avenue, Rural Road, and College Avenue, as well as at residential parking stalls along Broadway Lane, and in between the median islands to on Broadway Road. Additional features include a new metered pedestrian crossing east of Sierra Vista Drive which also has decorative stamping, clearly delineated eastbound and westbound bike lanes, increased sidewalk widths from 4 feet to 8 feet wide, major improvements to nighttime illumination of the corridor, and vast improvements to the landscaping throughout the entire corridor with the planting of plants native to Arizona. Major Subcontractors: Westar Environmental (Landscaping), Trafficade (Traffic Control), Creative Paving Solutions (Stamped Asphalt), Via Sun Corporation (Slurry Seal), L&L Asphalt (Paving), Sun Dial Masonry (CMU), and Roadway Electric LLC (Electrical). Visit Achen-Gardner Construction’s website and Facebook page for more project information and photos. 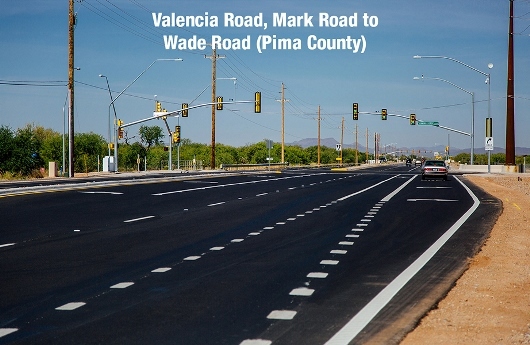 Project Background:The Pima County Department of Transportation (PCDOT), in conjunction with the Regional Transportation Authority's (RTA) Roadway Improvement Plan, is working to improve the Valencia Road Corridor from Mark Road to Ajo Highway. 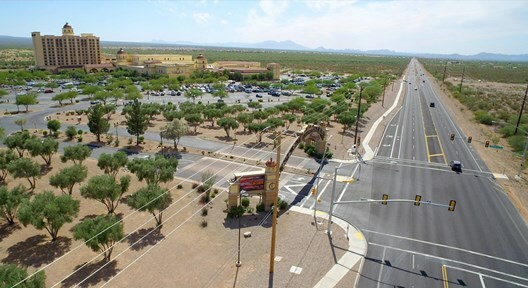 The RTA's Roadway Improvement Plan, which was approved by Pima County voters in May 2006, proposed that this existing two-lane arterial be designed as a "desert parkway" and provide multi-modal transportation improvements. In October of 2014, Achen-Gardner was awarded the Valencia Road – Mark Road to Wade Road improvements project using the Design-Bid-Build delivery method. This 2.5-mile, two-lane roadway experienced constant flooding and closures during the monsoon season. The project not only included roadway widening but also significant drainage improvements. The final scope of work consisted of constructing a four lane arterial roadway with a raised median along the Valencia Road alignment from Star Diamond Place (west boundary of the project approximately 1,800 feet west of Wade Road) to Camino Rancho and a five lane arterial roadway from Camino Rancho to the east boundary of the project (approximately 1,600 feet west of Mark Road). This project included importing more than 100,000 cubic yards of material to raise the roadway between one and four feet and installing six cast-in-place concrete box culverts to control and direct water flow in the Black Wash floodplain. Project Execution and Phasing: The Valencia Road improvement project was unique in that almost all fundamental elements of roadway construction were involved including earthwork, concrete structures, paving, and new traffic signal installation. All of this work needed to be completed while maintaining two-way traffic on Valencia Road, which is a major arterial for commuters and prone to frequent traffic jams during peak hours. In addition to the high volume of traffic, this section of Valencia Road experiences several closures every year due to storm water. Phasing the project in this way allowed for the crews working on the box culverts to proceed in front of the roadway construction crews while also allowing traffic to flow in both directions on Valencia Road. In some areas, the new section of Valencia Road was four feet higher than the existing road, causing traffic to be on the top of an embankment with concrete barriers separating them from the work below. Basically, the south half of Valencia Road could be completed while traffic remained on the existing two-lane roadway to the north. Once the new road section was completed in each phase, traffic was shifted so that they remained unaffected by adjacent construction activities. As mentioned earlier, this section of Valencia Road was susceptible to flooding and restricted or shut down several times every year by monsoons and large rain events. The project team is proud to have completed this entire project without having to close the roadway in any areas due to flooding. Working with Stakeholders: In addition to Valencia Road being used as an artery for commuters, the Casino Del Sol Resort was located within the project limits and required coordination throughout the project. Casino Del Sol is a large attraction for locals and visitors and remained busy throughout the year. Needless to say they were a major project stakeholder. Part of the execution plan in this area involved coordination with the Casino on keeping their main entrance accessible at all times. As part of this project, the main entrance was enhanced with a new signalized intersection and the branding of Casino Del Sol Drive. The project team met with respresentatives from Casino Del Sol to coordinate timing and execution of these improvements to minimize impacts. It was decided that during the Casino’s planned four-day shutdown that Achen-Gardner would implement a full closure of the entrance and complete the work in that area. The Casino commenced their shutdown, and the work was completed within the required time frame. Teamwork and Project Success: The Valencia Road improvement project marked Achen-Gardner’s first project with the PCDOT. This project began with a partnering meeting that included major stakeholders, PCDOT representatives, and field inspection personnel. From this meeting, it was decided that the project team would work, free from personal agendas and with open minds, to solve field issues and coordinate with stakeholders to deliver a high-quality project for the taxpayers of Pima County. Throughout the project, Achen-Gardner and Pima County partnered on issues to come up with amicable solutions as well as implemented value engineering ideas. For example, the work on Camino Verde, north of Valencia Road, was initially scheduled to take a month to complete and the phasing would have resulted in prolonged negative impacts to the travelling public. Achen-Gardner requested a complete closure of the roadway for two weeks in order to complete the work and minimize public inconvenience. Pima County granted the closure with the stipulation that the two-week schedule be met by any means necessary. This section of roadway was delivered on time, as promised, even with the excavation and replacement of approximately 1,000 cubic yards of unsuitable subgrade material which delayed the already aggressive two-week schedule by one day. What do you get when you take employees from the architecture, engineering, and construction (A/E/C) industry, a large quantity of canned food of various sizes and colors, and a lot of creativity and ingenuity? You get the 10th Annual Canstruction® Design-Build Competition benefitting St. Mary’s Food Bank. This year’s competition will be held on August 6, 2016 at the Phoenix Convention Center West Building. Canstruction® is a unique international non-profit organization which hosts competitions, exhibitions and events showcasing structures made entirely out of full cans of canned food. After the structures are built, they are on display to the public as a giant art exhibition. At the end of the viewing, all food is donated to St. Mary’s Food Bank. Last year over 50,000 pounds of canned food was donated, the largest single donation to St. Mary’s. The Phoenix Canstruction® event is hosted by the Society for Marketing Professional Services (SMPS). Last year the event included 12 teams. Each team must have at least one member who is an architect, engineer, contractor, professor, school teacher or other designated design professional to provide mentorship. The teams are required to design, acquire/purchase cans, and build their structures within a 12 hour timeframe using minimal additional materials. The structures must fit within a 10x10x10 area. Other materials that are allowed include one-quarter inch thick form core (gator board); cardboard, masonite, plexiglas – for the purpose of leveling or balancing materials (not load bearing); one-quarter inch cardboard tubes used as guides; Velcro, clear and double-sided tape; and high-tension rubber bands, nylon string, wire and tie backs. Once the structures are complete they go through a judging process. Judges select winners for the following categories: best use of labels, best meal, structural ingenuity, juror’s favorite and honorable mention. There is also a people’s choice award where the public can vote via ballot (on-site) or through Facebook. The winners are announced at an annual awards ceremony and are also entered into the international competition. The structures are displayed for two weeks (August 7 – 20) at the West Building of the Phoenix Convention Center. Canstruction® events are hosted in over 150 cities around the world located in North America, Australia, South America, Europe, and Asia. The event was founded in 1992 by the late Cheri Melillo and her colleagues from the Society for Design Administration (SDA). The first office competition was held in New York City on November 13, 1993. The SDA championed the cause by asking their member organizations to host events throughout the county. Later the American Institute of Architects (AIA) and the Can Manufacturers Institute (CMI) joined in to expand the event. Since its inception, Canstruction® has grown to be one of the largest contributors to local food banks in the word. Registration to participate in Canstruction® Phoenix ends on May 27, 2016. For more information or to sponsor the event please send an email to phxcanstruction@gmail.com. The City of Phoenix, Street Transportation Department is currently advertising for three Civil Engineer III positions. Two positions are within the Design and Construction Management Division managing engineering/architectural consultants and construction contractors, supervising City staff and performing project management duties for Capital Improvement Program (CIP) projects including studies, design and construction related activities. The third position is a temporary vacancy within the Transportation, Planning and Programming Division which will oversee the coordination and the development of Arizona Department of Transportation’s 22-mile South Mountain Freeway Program with members of the City of Phoenix Street Transportation Department. For additional information about the positions and how to apply, please visit https://www.phoenix.gov/hr/current-jobs and select the “Civil Engineer III – Street Transportation” advertisement. The conference will be held at the beautiful Hilton El Conquistador in Oro Valley, Aug 10-12. Rooms are $89 and are available from Tuesday Aug 9th thru Sunday Aug. 14th. The room block is now open for reservations. See conference website Accommodations tab to book your room early. A variety of Sponsor packages for any budget are also available now. Please consider a sponsorship this year. This spring our chapter will be moving ahead with updates to our chapter by-laws to reflect new guidelines from APWA National and to change our fiscal and administrative years. Periodically, AWPA National updates their model by-laws that all chapters are expected to adopt to reflect changes in operational, legal, and/or fiscal requirements to help keep the association and its chapters operating effectively. APWA National recommends that chapters periodically review their chapter by-laws and update them to reflect their current needs. Members and the State Board can also request changes to the by-laws (see Article XVI, Section 1). In December of 2015 APWA National mandated that by July 1, 2017 all chapters must change their fiscal year to run from July 1st through June 30th of the following year. Currently, the Arizona Chapter’s fiscal (and administrative) year runs from January 1st through December 31st. This change by National has been on the table for several months now. There was a special session at the 2015 Congress/Expo for chapter treasurers to explain the rationale for the change and present options for making the change in ways to minimize disruption to the chapters. Below is a link to information provided by National that discuss the change and options to implement the change. If you would like more in depth information, the Board encourages you to go to this document for additional details. The discussion below gives a brief summary of the discussions and decisions of the State Board for implementing the required change. National provided two options for chapters to make the transition. Since the Arizona Chapter’s fiscal year currently runs from January 1 through December 31, the State Board opted for the Arizona Chapter to have a “normal” fiscal year (January to December) in 2016. The transition to the new fiscal year will be implemented by creating an 18-month budget covering the period from January 1, 2017 to June 30, 2018, with the new fiscal year beginning July 1, 2018, which is the deadline established by National for chapters to have transitioned their fiscal year. Every chapter needs to update their by-laws to reflect the change in fiscal year. To assist in this effort, National issued a new set of model by-laws that, with some customization to reflect the name and territory of the individual chapters, are to be adopted by the chapters. These types of by-law updates don’t require the vote of the membership of a chapter. The new model by-laws specify chapters are to have a Vice-President as part of their officers. Traditionally Arizona has not had a Vice-President and the State Board felt that there was no need to create this office. National agreed that Arizona could delete the sections that refer to a Vice-President. The new model by-laws specify that state directors are to be elected for 3 year terms. Traditionally state directors of the Arizona Chapter have been elected for 2 year terms. The State Board felt continuing this practice was preferred. National was agreeable to this change in the model by-laws. The new model by-laws specify that a chapter’s administrative year is to run concurrent with the calendar year (January 1st to December 31st). Traditionally, in Arizona the fiscal year and the administrative years run concurrently. The State Board felt it would be more effective for chapter operations to continue this practice so the by-laws were changed to reflect an administrative year that would run concurrent with the new fiscal year (July 1st to June 30th). While the other changes to the model by-laws are mandated/approved by National, the change in the administrative year will require a vote of the chapter’s members since this is a change in our current by-laws. This change to the model by-laws was also discussed with National and they will approve it. The State Board plans to present the proposed change in administrative year to the membership for a vote this summer/fall on the same ballot as the slate of next year’s officers and directors. Officers elected this summer/fall will serve an additional 6 months for a total of 18 months in their newly elected positions. This special term will run from January 1, 2017 until June 30, 2018. In subsequent elections officers will serve the traditional 12 month term (July to June). Directors elected this summer/fall will also serve an additional 6 months for a total of 30 months in their newly elected positions. This special term will run from January 1, 2017 until June 30, 2019. In subsequent elections directors will serve the traditional 24 month term (July to June). Directors currently serving the first year of their traditional two year term will have their term extended, by Board action, an additional 6 months for a total of 30 months in their current positions. This special term will extend these directors through June 30, 2018. In subsequent elections directors will serve the traditional 24 month term (July to June). A great time was had by all at the annual family picnic, held Sunday, April 10th at the McCormick-Stillman Railroad Park. Although the picnic was met with quite a bit of rain, the weather cleared up just enough for some train and carousel rides to be enjoyed by kids and adults alike. Sandwiches for the families were provided by APWA and guests brought a dish to share. The Events Committee would like to give a special shout out and thank you to our sponsor CADSoft Consulting, Inc., who provided free tickets for the rides!! Mr. Michel A. Hulst Vice President of Environmental and Water Resources NV5, Inc.